1. wrapped yarn around a foam wreath form (this was the most time consuming step, by far) If you have the option to get a ball of yarn rather than the long tubey shape (is there a name for that?) go for that one because the large tubey kind doesn't fit through the hole well and I had to keep cutting long strands of yarn, which inevitably got all balled up and knotted while I was working. 3. I made fabric flowers using these tutorials for felt flowers. I decided to forego the felt because it is my least favorite material in the entire world (there's just something yucky about the way it feels on your fingers, I also feel this way about velvet). I thought it was fun to use fabric with flowers already on it, and I simply cut around the flowers. 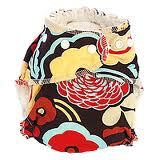 This was the print, it's the same as the Kissaluvs Marvels Mocha Swirl fitted diaper! 4. I glued all the prettiness the way I wanted and added a pre-made "cheerleader bow" because I don't possess the greatest bow-tying skills.